call +1 (216)265-9000 or fax +1 (216)265-9030. 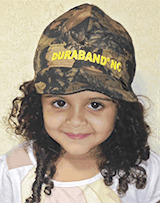 CWC-CFAC Cotton Welding Cap 6 Panel camouflage, one size fits all. Made of pre-shrunk 100% cotton. They fit snuggly on the head and are fully reversible. (U.S. Des. Patent No. D754,007)This easy to use gauge will help you determine whether a new hardband application is needed and help set the proper stickout. Includes USA and metric measurements and slots to measure 1/32”, 3/32”, and 1/8” thicknesses as well as torch stickouts.